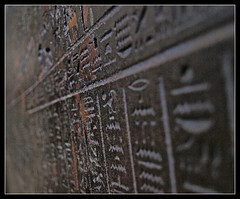 Written in Stone, a photo by thehutch on Flickr. Looking at our history is important as it provides a source of identity, a place to belong in the narrative of life and can provide insight in to avoiding pitfalls. However, when our history is used to constrict us, hold us back, prevent growth or forward movement, it becomes anathema.